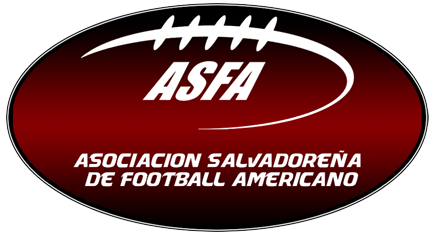 ASFA, one of the two American Football leagues in El Salvador saw their two finalist teams, the AGUILAS of Santa Tecla and the BARBARIANS of Antiguo Cuscatlan compete in the ASFA Bowl 2014. This was the premier Bowl for the ASFA since it’s inception 3 years ago. The game opened with a barrage of colossal hits and takedown tackles. The first touchdown was scored by an AGUILAS player, Francisco Menjivar after the initial kickoff. However the AGUILAS failed to make the 2 point conversion. After the touchdown, the 2 point conversion was made by Fernando Landaverde who took an effective 5 and out route to be alone on the right side of the end zone to make the conversion. 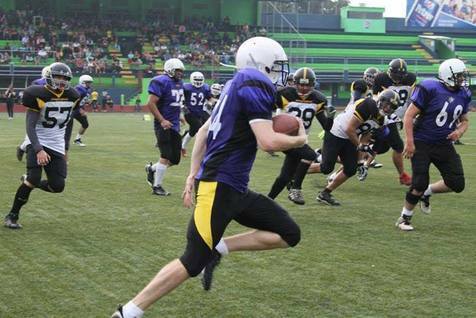 Men are not the only ones who are being captivated by the allure of American Football in Latin America. Throughout the region Women’s Flag Football has been gaining an enthusiastic following of women committed to learning and playing this complex, yet beautiful sport. 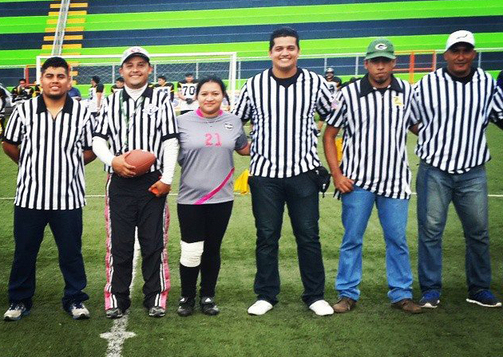 The ASFA Women’s Flag Football Championship game between the CELTAS of Santa Tecla and the BARBARIANS of Antiguo Cuscatlan was a testament that ‘women can play too’… Both of the two teams remained strong defensively throughout the entire game but a judgment error on the right side of the CELTAS defense opened a hole in which Olga Flores ran 45 yards to the end zone for the only touchdown of the game. At the end of the play she also scored an extra point by a kick. 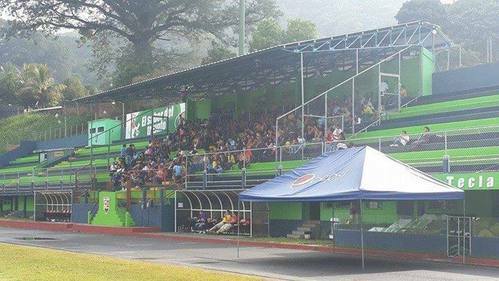 The ASFA Bowl 2014 included the two aforementioned championship games and was held at the Estadio Las Delicias in Santa Tecla with an overall attendance of approximately 350 fans, meeting the expectations of the sport promoters. Experienced players and coaches from teams not participating in the games don the stripes. Referees participate in weekly sessions honing their rules and regulations knowledge. The ASFA 2014 championship calendar culminated a total of 14 games between the teams; AGUILAS of Santa Tecla, BARBARIANS of Antiguo Cuscatlan, Santa Ana BRAVOS and LEONES Soyapango. 10 games played out over the game season for the Women’s Flag Football teams; CELTAS of Santa Tecla, BARBARIANS of Antiguo Cuscatlan and LIONESSES of Soyapango.